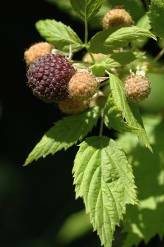 Black cap raspberry (black cap hence forth) has a large distribution range that extends from British Columbia south to California reaching east to Montana and Utah. Black cap prefers full to dappled sun and moist soil. Can not tolerate saline or windy conditions and has a low drought tolerance. In Washington specifically, it is found in the basins as well as up along the Cascade and Olympic mountains ranges. Black cap can be found in fields and on open or wooded hillsides from lower to more moderate elevations. 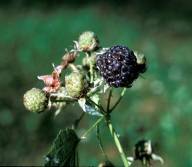 Black cap is found in disturbed areas and has a high fire tolerance. If soil moisture is appropriate then this species could be a colonizer. Its specific strategy is to grow tall (up to 6’) and produce an abundance of seed. This would be an early successional species. Black cap has been found to be associated with the Bigleaf Maple complex. This complex includes big leaf maple (Acer macrophyllum), salmonberry (Rubus spectabilis), trailing blackberry (Rubus ursinus), sword fern (Polystichum munitum) and bracken fern (Pteridium aquilinum). 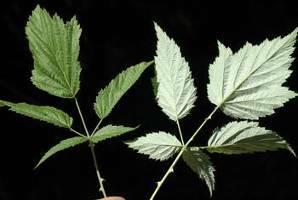 Other shrub species that may occur with varying abundance are red elderberry (Sambucus racemosa), devil's club (Oplopanax horridus), redosier dogwood (Cornus stolonifera), salal (Gaultheria shallon) and stink currant (Ribes bracteosum). Red alder (Alnus rubra) is a minor component in some stands. Black cap has also been found in Giant Sequoia (Sequoiadendron giganteum) groves. Black cap may be collected as seeds, divisions, and cuttings. Since conservation status is not currently tracked, there are no government collection restrictions at this time. Ideally collection for seeds would occur when seeds are ripe. Fruit period begins in summer and extends through fall. Cuttings of half-ripe wood maybe collected in July. Tip layering may be started in July to be planted out in the fall. Divisions can be collected in early spring before leaf out or before leaf drop in the fall. Seeds have a cold stratification requirement of at least 30 days at 3o C. There has been some research showing that treatment with sodium hypochlorite may simplify seed germination. Specific information about seed life for black cap was unavailable. Since seed production is abundant and vigor is high, recommend yearly collection. Specific information about seed storage and viability for black cap was unavailable. Recommend dry cold storage. Black cap may be propagated by a variety of methods. Since seed vigor is high this would be the easiest and cheapest method. They can also be propagated from cuttings, sprigs and bare root. Black cap is adapted to a variety of soil types. It has a minimum pH tolerance of 5.6 to a maximum of 7.3. No inoculum is necessary. Recommended installation form is seeds. This material is both easily transported and relatively cheap. Divisions and bare roots would be also be relatively cheap but would require correct timing logistics to be worked out in advance. Recommended planting densities range from a minimum if 1200/ acre to a maximum of 4800/ acre. Care should be given to locate newly planted black caps in an ideal location. They have medium water requirements with low drought tolerance and a minimum of 120 frost free days. They are intolerance of anaerobic conditions as well as windy locations. If located properly, no special care is required after installation. Black cap is a perennial arching vine. It grows at a rapid rate during both spring and summer creating dense hedges. The blossoms and fruit appear on two year old canes that die back at the end of the season.